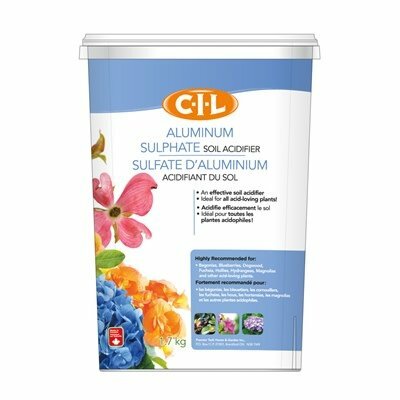 An effective soil acidifier ideal for all acid-loving plants! Highly Recommended for: Begonias, blueberries, dogwood, fuchsia, hollies, hydrangea, magnolias, and other acid-loving plants. Directions for Potted Plants: Dissolve 3mL (3/5tsp) per litre of water and apply every 2-3 weeks. This is an effective rate to change Hydrangeas to blue. Directions for Garden Areas: Apply 1kg (2.2lb) evenly over 20m² (200 sq.ft) or apply 125mL (1/2 cup) to medium sized plants. Treatment may be repeated every 3-4 weeks. Caution: So not put in direct contact with roots or damage to plants may occur. Guaranteed Minimum Analysis: Aluminum (17%), Sulphur (16%), Neutralizing Value (36%).